April 5, 2019 | Welcome to Little Gull Marina! Well we promised exciting news and updates this week and we hope we can live up to that promise. We have been busy for the last 4 weeks building new docks! These include new gas docks (not pictured), and 2 sections of brand new slips to replace the oldest docks here. 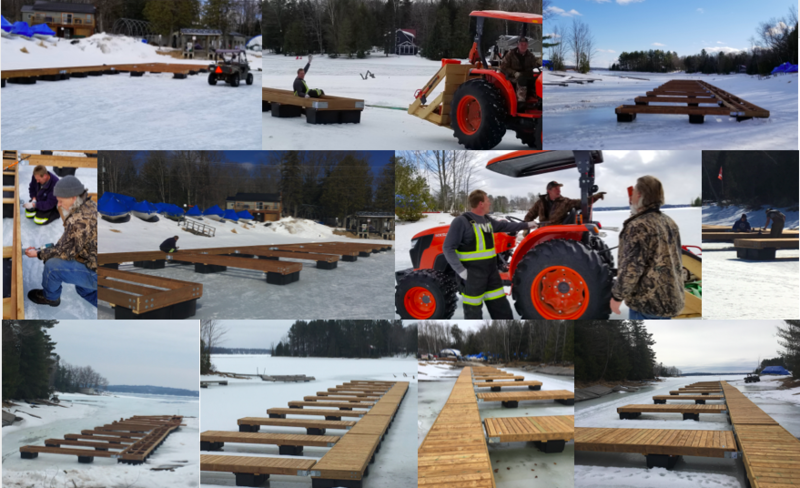 Led by the expertise of Ryan, our resident dock builder, we’ve had help from all of our full time staff, and even a guest appearance from a friendly face who lives south of the border! We’ve jumped on them, ran across them and tried to rock them to make sure they are sturdy and stable and so far they have passed with flying colours! The foot of ice they are on might have impacted test results…we’ll get back to you when they are floating. There isn’t much else to report here other than there is still lots of ice on the lakes, but they have started bringing the water levels up, so the ice is slowly pulling away from shore. We’ve updated our events page for this season with as much as we know of so far. Lori Harper is running an Emergency First Aid and CPR-C course at the community centre on June 8th, as well as swimming lessons again this summer. We are still closed on Sundays until Mother’s Day, but here Monday – Saturday from 9am-4pm. Have a great weekend and enjoy the spring-like weather they are predicting.